The 7th Annual Remember Rockford Families Reunion is planned for Saturday, September 10, 2016 from 10 a.m. to 4 p.m. The day’s events will begin at the Rockford Methodist Church. The Nonesuch Playmakers Theatre Group will be back this year led by Brack and Angela Llewellyn. 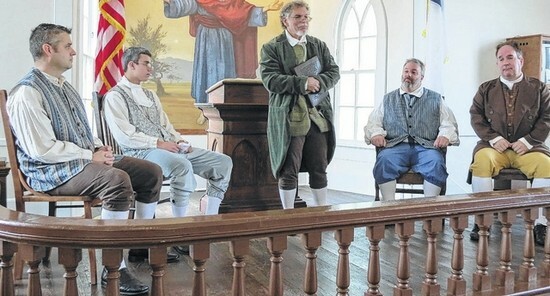 The group will portray Rockford’s earliest founders and community leaders in a living history drama. A few of the characters will include: John Thomas Longino, Jesse Lester, William Polk Dobson, Thomas Ayers, and Henry Speer. Additional activities include sharing of family and local history, tours of our historic buildings, and traditional music by Ashley Holyfield and Devin Matthews. A BBQ lunch will be served at the Rockford Methodist Church and is $10 for adults and $5 for children. This Reunion allows families whose ancestors were a vital part of the development of Rockford and Surry County to reconnect. Folks are encouraged to bring their family histories and photographs to share with Reunion attendees. A copier will be in the church. Surry Community College has a local history/genealogy room available to the public for research and would be open on Friday, Sept. 9 until 2:30 p.m.
Go to www.rememberrockford.com to find a registration form to mail to the Rockford Preservation Society, Inc. at 4844 Rockford Road Dobson, NC. Or email Hannah Holyfield at hannah@rockfordbedandbreakfast.com. Call 336-374-3825 for more information.